If your lawnmower is the type that has a bag for grass clippings, you will need to take the bag off to dispose of the clippings. While the mechanisms holding lawnmower bags in place differ between manufacturers and models, the way these bags are removed is generally the same. It is a relatively easy process, and one that requires no special tools or skills to accomplish, although you may want to consult your owner's manual to reattach the bag after removal. Turn the mower off. Your mower should not be running when you remove the bag. If it is still running, you run a great risk of getting a face full of grass clippings and other yard detritus. Park the lawnmower on a level surface. If no level surface is available, park it against a solid surface or apply the parking brake on one of the rear wheels. 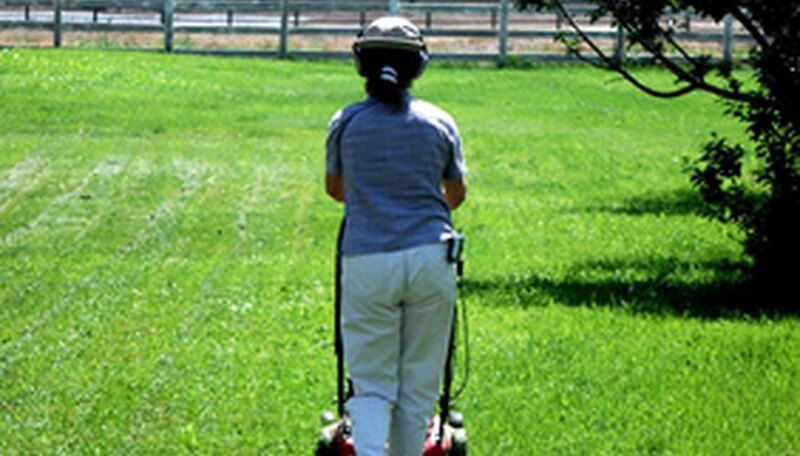 It is essential that your lawnmower not roll away from you while you are trying to remove or reattach the bag. Lift the flap that runs over the top of the lawnmower bag. These are usually plastic and should lift easily. Face the lawn mower from the back, as though you were going to use it to mow the lawn. Reach underneath the flap on both sides of the mower with both hands. Feel the sides of the bag. In addition to the cloth that makes up the body of the bag, you should feel metal poles underneath it, which give the bag its structure and ensure that it does not collapse in on itself. This metal frame is also what locks the bag into place on your lawn mower. Grasp the metal frame from both sides, and gently pull the bag up and out. It should come away from the body of the mower easily. Be prepared for the profusion of loose grass clippings that will probably fall out of the mower. If your lawnmower bag is very full, they will probably fall out of the bag as well once you have separated it from the mower. Discard the grass clippings as you see fit--in yard waste bags, as mulch for your lawn or in your compost pile. Reattach the lawnmower bag to your mower as the manufacturer’s manual instructs. In many cases it should just snap back into place by performing these steps in reverse. Check your manufacturer’s manual to ensure that you are performing the correct process.